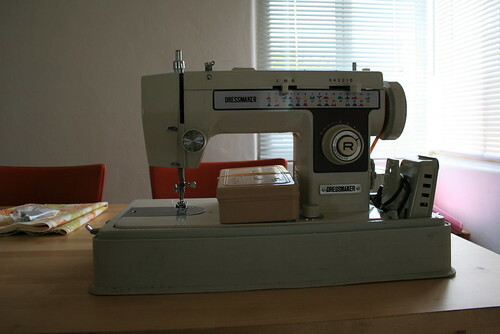 Jenn and Romy: Today I Got a Free Sewing Machine! Today I Got a Free Sewing Machine! Craigslist.com is so awesome! We've been browsing the items for sale/free on the site for the things we need. I wanted to make some curtains, but realized that I didn't have a sewing machine. I was so used to having one back at home, that it was almost suprising not to have one now. So I checked out craigslist.com for some sewing machines. I also checked out what Walmart had, and the cheapest one was about $80. So I thought that it would be reasonable to pay about $30 for a used one. When I was browsing craigslist.com, I came across a FREE sewing machine. Some lady in a rich area of Oakland was just trying to get rid of hers! So I e-mailed her last night and said I would like to take it if she still had it. So she told me she did still have it and that she would leave it in her driveway for me to pick it up today. I wasn't expecting much for "free." But when we went to pick it up, it looked good, and when I tested it out on a scrap piece of fabric, it sewed great! What a deal! I took a picture of it. I think its from the 80s or early 90s, but I'm not sure. While I was at it taking pictures, I took a few more. Here's a sneak peak of our apartment. I don't want to take too many pictures right now because we still have boxes all over, and its really messy. 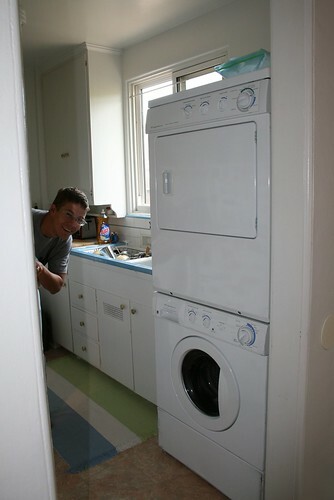 Above is a picture of our kitchen, with the washer and dryer installed. The kitchen hasn't really been remodeled since the 50s or 60s. It has a deep ceramic double sink, with blue and white tile countertop. The stove is gigantic (which you can't see in this picture) and is also from the 60s. I thought I wouldn't like it at first, but it is great to cook on! Its very simple and it has style. All the cabinets are built in, and there are all kinds of secret storage places. Outside of the kitchen is a lemon tree (which is actually in the neighbor's yard), and lemons hang into our backyard. 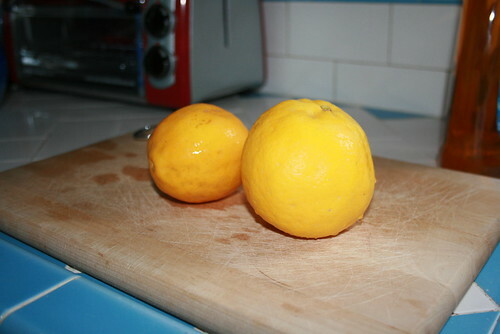 I've been wanting to pick some lemons, since they look ripe, so today I finally did. Here's a picture of two that I picked. I cut them open to see if they were good, and they were! Its kind of exciting to pick lemons. The good ones are at the top of the tree, so you have to climb high. Our New Address Is . . .